Coconut water has gained in popularity as an alternative to sports drinks or recovery drinks for runners and other athletes. It is low in calories, fat-free, and cholesterol-free. 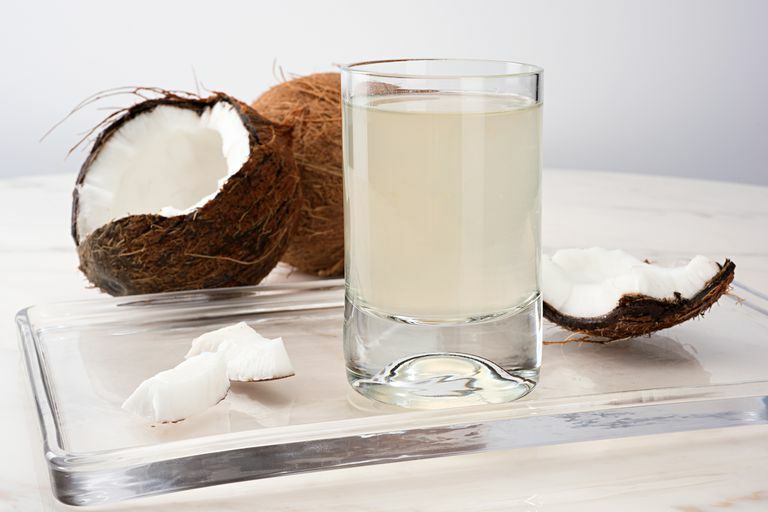 Coconut water is different from high-fat coconut milk or coconut oil. It's a clear liquid that comes from the center of young, green coconuts. A natural alternative to commercial sports drinks, coconut water contains easily-digested carbohydrates in the form of sugar, as well as electrolytes such as potassium and magnesium that runners and athletes lose during workouts. However, coconut water does not contain the levels of electrolytes, especially sodium, that are found in sports drinks and are necessary to replace all of the electrolytes lost through sweat. Commercial sports drinks, such as Gatorade, offer a complete hydration and electrolyte replacement option for runners who are running for more than 60 minutes. Some runners still opt for coconut water during long runs because their sensitive stomachs can't tolerate the sugar and artificial sweeteners in many conventional sports drinks. On the other hand, you should definitely see how well you tolerate coconut water before you decide to use it for a long run. One study found the subjects didn't like the taste, and as a result drank far less of the coconut water than they did plain water, which could put you at risk of dehydration. Another study found that the subjects experienced more bloating and stomach upset when using coconut water as compared to a sports drink. If you find that you enjoy coconut water and tolerate it well, you may want to add a few sprinkles of salt to it or do a salt shot halfway through your long run to make sure you're replacing sodium. Don't forget that if you're running less than an hour, you don't need to worry about electrolyte replacement, so plain water should suffice. However, if you like the taste of coconut water, it's certainly a good option for those shorter runs. Unlike plain water, coconut water does contain calories. Although it's lower in calories than sports drinks, soda, or fruit juice, an 11-ounce container contains 60 calories. That can add up if you drink it throughout the day. Be sure that you look for unsweetened varieties, as some coconut drinks contain added sugars (and therefore more calories). Coconut water is also used by runners as a recovery drink and a natural way to replenish electrolytes after a hard run or workout. Some runners like to mix it with protein powder to make sure that they're getting the ideal 3-to-1 protein to carbohydrate ratio for optimal recovery. It is important to stay hydrated during endurance exercise and replenish your body after exercising. Coconut water can be one way to do that, but only if it is something you enjoy drinking. It has long been a recommendation of the American College of Sports Medicine that whatever you use for fluid replacement must be palatable so you will drink enough of it. Kalman DS, Feldman S, Krieger DR, Bloomer RJ. Comparison of Coconut Water and a Carbohydrate-Electrolyte Sport Drink on Measures of Hydration and Physical Performance in Exercise-Trained Men. Journal of the International Society of Sports Nutrition. 2012;9:1. doi:10.1186/1550-2783-9-1. Peart DJ, Hensby A, Shaw MP. Coconut Water Does Not Improve Markers of Hydration During Sub-maximal Exercise and Performance in a Subsequent Time Trial Compared with Water Alone. International Journal of Sport Nutrition and Exercise Metabolism. 2017;27(3):279-284. doi:10.1123/ijsnem.2016-0121. Pérez-Idárraga A, Aragón-Vargas LF. Postexercise Rehydration: Potassium-rich Drinks Versus Water and a Sports Drink. Applied Physiology, Nutrition, and Metabolism. 2014;39(10):1167-1174. doi:10.1139/apnm-2013-0434. Is Cold Water Good or Bad When Exercising? To Stretch or Not To Stretch for Exercise? Should I Run With a Hangover? Should You Take a Pain Pill Before or During a Marathon?